Founded in 1979, the McPherson Trio has performed to popular and critical acclaim from Veracruz, Mexico to Fairbanks, Alaska, BC and Alberta. 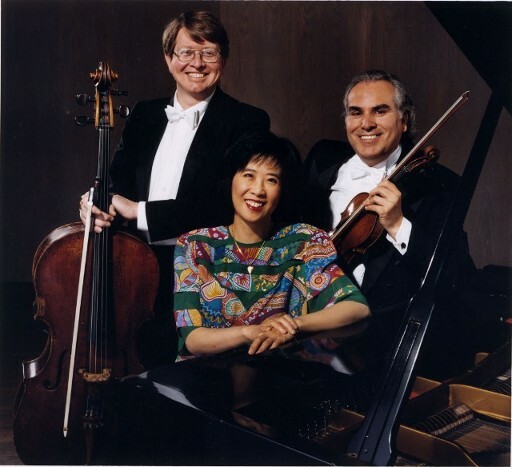 Pablo Diemecke, violin, May Ling Kwok, piano, and Lawrence Skaggs, cello, have worked together for many years, building a solid repertoire of works for piano trio, ranging from Mozart and Haydn to Ravel and Shostakovich. In addition to regular trio chamber recitals, the McPherson Trio has performed the Beethoven Triple Concerto with the Victoria Symphony. Their CD recording of the Trio in d minor, Op. 32 by Arensky, and the Trio No. 2 in e minor, Op. 67 by Shostakovich, on the Mastersound Label. May Ling Kwok has been on the piano faculty of the Victoria Conservatory of Music and the University of Victoria since 1982. She has performed extensively in North America, Mexico, Europe, Russia and the Far East, in recitals and with symphony orchestras. Her recordings of the Beethoven First Piano Concerto and the Schumann Concerto are available on Fanfare- Mastersound Label. Pablo Diemecke, former concertmaster of the Victoria Symphony, and the Colorado Festival Orchestra. His solo engagements have taken him throughout North America and Europe, and his recordings include concertos by Prokofiev Mozart, Dvorak and Carlos Chavez. Lawrence Skaggs has been Principal Cellist of the Victoria Symphony since 1976. Originally from California, he has had an active career in chamber, solo, orchestral and studio work, including tours of British Columbia and Alaska with the Brahms Double Concerto, and the premier performance of the Shostakovich Cello Concerto #1 in Victoria.